Illustration from the Bamberg Apocalypse of the Son of Man among the seven lampstands. John, the author of Revelation, was exiled to the island of Patmos, possibly during the reign of the emperor Domitian. He says that on the Lord's Day he was "in the Spirit", and heard a loud voice "like a trumpet" (1:10). When he turned around, he saw this Son of Man figure. In 1:18, the figure whom John sees identifies himself as "the First and the Last," who "was dead, and behold I am alive for ever and ever" — a reference to Jesus' resurrection. Some of the language used in Revelation 1 is also used in Revelation 19 to describe the Rider on the White Horse. In both places he has a sword coming out of his mouth (1:16 and 19:15) and has "eyes like blazing fire" (1:14 and 19:12). The Son of Man in this passage is portrayed as walking (2:1) among seven lampstands, which represent seven churches (1:20). Chapters 2 and 3 report letters written to the seven churches by John as it was revealed to him by the Son of Man. In 1:11, he says, "Write on a scroll what you see and send it to the seven churches," while throughout the letters he is identified in terms of the vision, such as "him who has the sharp, double-edged sword" (2:12). William Hendriksen suggests that the whole of the vision "is symbolical of Christ, the Holy One, coming to purge His churches," and to "punish those who are persecuting His elect." Robe and golden sash "Reminders of the official dress of the High Priest"
"Wisdom and the dignity of age"
Eyes like blazing fire They "read every heart and penetrate every hidden corner"
Voice like rushing waters "The awe-inspiring power of a great waterfall"
"The right hand can be interpreted as a source of power and protection"
Astrological imagery: "The stars may be thought of as controlling human fate, but Jesus controls the stars"
Double-edged sword coming out of his mouth "His Word that works to save and to destroy"
Reverse of a denarius of Domitian depicting his son with seven stars. 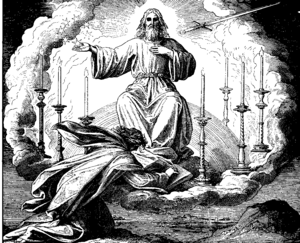 One aspect of the vision is the portrayal of Jesus holding seven stars in his right hand. Such a motif is also found on coins of the emperor Domitian. Sometime between 77 and 81, Domitian's infant son died. He was subsequently deified, and is portrayed on coins of Domitian, with seven stars. Ernest Janzen argues that the globe on which the infant stands represents world dominion and power, while the stars indicate his divine nature; he is depicted as "the son of (a) god" and "conqueror of the world." Austin Farrer, on the other hand, takes them to be the seven classical planets, and interprets the vision as representing Christ's lordship over time. 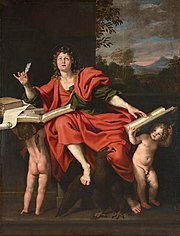 Although Domitian's son cannot be said to be holding the stars, some scholars have drawn parallels between the numismatic and biblical evidences. Frederick Murphy notes that "Revelation's image of Jesus with seven stars in his hand may be an allusion to that coin and an implicit critique of it. It is not the Roman imperial family that has cosmic significance, but Jesus." John tells us in Revelation 1:20 that the seven stars are the angels of the seven churches  In commenting on this verse, C.I. Scofield states: The natural explanation of the "messengers" [angels] is that they were men sent by the seven churches to ascertain the state of the aged apostle ... but they figure any who bear God's messages to a church. In the New Testament, the Greek word for angels (aggelos) is not only used for heavenly angels, but also used for human messengers, such as John the Baptist (Matthew 11:10,Mark 1:2,Luke 7:27). Merrill Unger is of the opinion that human messengers is the meaning of the stars. ^ Charles Souvay, "Patmos," in The Catholic Encyclopedia. Vol. 11. New York: Robert Appleton Company, 1911. ^ Jack Finegan, The Archeology of the New Testament: The Mediterranean world of the early Christian Apostles (Westview Press, 1981), 43. ^ a b William Hendriksen, More Than Conquerors: An Interpretation of the Book of Revelation (Tyndale Press, 1962), 56. ^ a b c d David Chilton, The Days of Vengeance: An Exposition of the Book of Revelation (Dominion Press, 1987), 73-76. ^ a b Leon Morris, The Revelation of St. John (Tyndale, 1969), 53. ^ a b Robert H. Mounce, The Book of Revelation (Eerdmans, 1977), 79. ^ Simon J. Kistemaker, Exposition of the Book of Revelation (Baker, 2002), 97. ^ a b Frederick James Murphy, Fallen is Babylon: the Revelation to John, (Trinity Press International, 1998), 91. ^ Brian W. Jones, The Emperor Domitian (Routledge, 1993), 36. ^ Ernest P. Janzen, "The Jesus of the Apocalypse Wears the Emperor's Clothes," SBL Seminar Papers 130 (1994): 645-47. ^ Austin Farrer, "Inspiration, Poetical and Divine," in Interpretation and Belief, 47.